Played your copy of Only By The Night to death? Well, a new bunch of indie singalongs could be about to take over your radio as Kings Of Leon are readying their follow-up to the 2008 smash album. 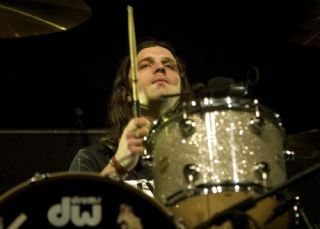 Drummer Nathan Followill has told Tennessean.com that the band's follow-up to the multi-million selling Only By The Night is almost complete. It seems Followill and his band of brothers are feeling confident about the new record, suggesting they hope to call the shots when it comes to the date the as-yet-untitled album drops. He said: "We might force the label to release it earlier than they want to, but oh well." Followill also revealed that the album is "coming along great" and fans can expect to hear new material when the boys head out onto the festival circuit this summer, starting with next month's stateside appearance at Bonnaroo. UK fans can catch the brothers at V Festival in August or at their own monster show at Hyde Park on 30 June. For more details head to www.kingsofleon.com.